Ready For Fun? First Take Off Your Shoes And Wait In Long Airport Lines : The Two-Way Airlines are expecting record numbers of spring break travelers. 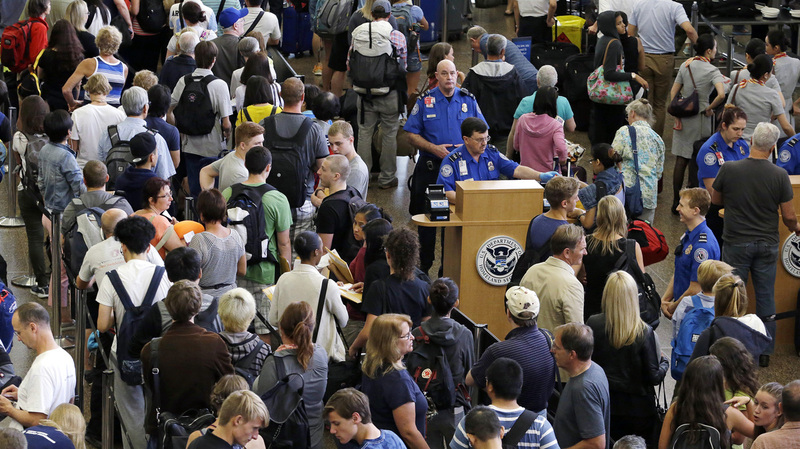 Both the industry and TSA are expecting airport screening checkpoints to have long lines. They urge travelers to arrive early. Lines of travelers snake past TSA agents at the Seattle-Tacoma International Airport last fall. Record numbers of airline passengers will soon be taking off for spring break, expecting to find fun. But first, they'll have to get through the Transportation Security Administration screening at the airport. Definitely no fun there. Both the TSA and Airlines For America (A4A), an industry trade group, say travelers should brace for long waits in epic lines. "It's a very serious concern," A4A Senior Vice President Sharon Pinkerton said on a conference call with journalists Wednesday. Earlier this week, the TSA released a statement saying it "expects passenger volumes to drastically increase throughout the month of March as spring breakers take to the skies and throughout the summer." TSA's top advice: "Arrive early." How early? Experts say passengers should get to the airport two hours before a domestic departure and three hours for international flights to clear the snaking security lines. Pinkerton says TSA needs more screeners. "The staffing is not adequate and it needs to be," she said. In addition, TSA equipment should be better maintained to avoid breakdowns, she said. TSA doesn't deny such problems, saying they reflect recent federal budget cuts. Also, officers must take more time this year to examine bags to reduce heightened terrorism risks. At a Senate hearing last week, TSA Administrator Peter Neffenger said his agency needs more funding to "right-size and appropriately resource TSA and halt further reductions in officer staffing." The Obama administration is asking Congress to support 42,848 officers by boosting TSA's fiscal 2017 budget to $3 billion, which would be $26.9 million more than fiscal 2016. Currently, TSA has roughly 41,000 officers on duty. The TSA troubles are coming at a time when travel has been surging, especially to sunny vacation destinations. For example, TSA says it expects 13 percent more volume at checkpoints in Orlando, Fla., this March, and 8.5 percent more at Fort Myers, Fla., compared with last year. A4A chief economist John Heimlich, also on the conference call, said Americans definitely are in the mood to travel. He said he's confident that in 2015, passengers set a record. The Transportation Department is expected to release the final headcount at 11 a.m. ET Thursday. Heimlich said he expects new records for 2016. He noted that for March and April — the peak time for spring break and Easter vacation travel — U.S. airlines are expecting about 140 million passengers, up from last year's record of 136.2 million. Back in 2007, before Americans hunkered down for the recession, the March and April total was 135.1 million. Airlines are responding to the new normal. "To meet the extra demand, airlines are deploying new and larger aircraft on many routes," Heimlich said. The strong demand has been allowing carriers to boost fares on many routes, especially in smaller markets with less competition. But carriers also have been offering discounts on popular flights in competitive markets. Overall, fares are up about $22 per round trip compared with last year, according to FareCompare.com, which tracks such changes. Last year, when jet fuel prices were falling, airline operating expenses were dropping as well — down by $14 billion, or 9.5 percent, the A4A said. A portion of those savings were passed along to consumers in the form of a 5.1 percent decline in fares for all of 2015. Lower fuel prices, combined with the higher demand for tickets, have been boosting airline earnings. The A4A report showed the industry collectively reported pretax earnings of $23.2 billion, resulting in a margin of 14.6 percent — up from 6 percent in 2014. But the trade group also pointed out how tough the recession was on the boom-and-bust industry. Over the past five years, U.S. carriers made a pre-tax profit of about 5 percent, far lower than the 13.8 percent average of the S&P 500 during the same period.